We are in the home stretch of our time here in Wyoming. As we’ve done in other places we’ve lived (Vancouver, Montreal, the U.K) we’ve started making a ‘Gotta Do Before We Leave’ list. 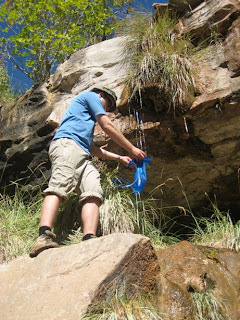 Top on Doug’s: a canyon hike in Utah. So last Wednesday morning we jumped in the Element (“Ellie”) and the Mini and headed along the I-80 West. Before venturing into the wilderness, though, we made our requisite stops in Park City at the recycling center, outlet mall, and Red Rock Brewery for lunch. Then we dropped off the Mini south of Salt Lake City for its last round of repairs and continued down the I-15 toward the Canyonlands, stopping briefly in the town of Helper to get Tylenol and muscle ointment: it was a really strenuous shopping trip! The sun was setting as we pulled into Green River, Utah which is basically a glorified truck stop of fast food restaurants and motels. We went middle-of-the-road and stayed at the Super 8, which was clean and backed onto sage flats – perfect for letting Riker run after being cooped up most of the day. While we mused aloud about GR, UT being like the evil twin city of our current hometown of Green River, Wyoming, we alas did not run into twisted version of ourselves and our friends there… maybe we’re the weird ones already! We got a decent night’s sleep after Riker stopped growling at people in the hall and by 6 a.m. we were up and ready to continue south toward our destination of Arch Canyon near Blanding, Utah. First we had to stop at the McDonald’s in Moab to grease up for the trek, of course, and ogle the insane number of R.V. parks chock full of these portable homes. Shudder…. 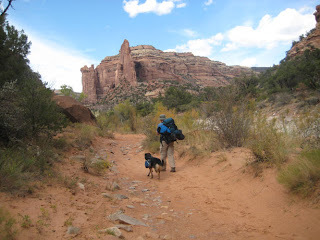 At 10:30 a.m. we were at the trailhead with our packs strapped to us – even Riker had one so he could carry his collapsible bowl, kibble, and treats! I was really surprised at how sandy the trail was, and it was a heck of a workout keeping our balance and getting up the hills. There was a lot more vegetation than I had expected as well, some of which – like the trembling aspens – were wearing their fall colours. After a 9-mile hike with breaks for lunch and a quick snooze we arrived at the junction of Arch and Texas Canyons where there was the biggest, most groomed campsite ever. 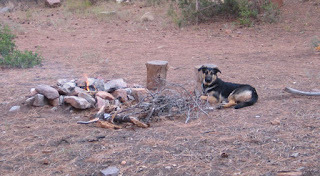 Plus there was a flaming red maple tree/bush which we took as a sign that us two Canucks and our American dog should set up camp there. 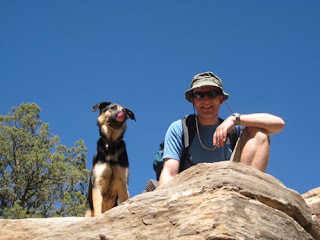 We made dinner – freeze-dried Katmandu Curry – followed by a dessert of freeze-dried dark chocolate cheesecake. In the real world these probably wouldn’t taste amazing, but out there after all that huffing and puffing, it was gourmet! 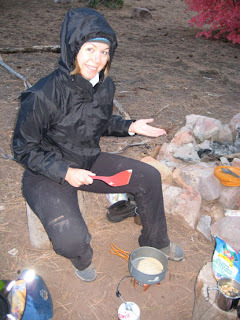 Unfortunately our freeze-dried pancakes the next morning didn’t turn out quite so well. Okay, they failed miserably. Probably because we had nothing to grease the pan with and the heat didn’t distribute very evenly. After one attempt that scorched the pan, we dumped the rest of the batter behind a tree. Which, of course, Riker proceeded to lick up. So I quickly made up some wraps with pb, honey, sunflower seeds and dried fruit, a recipe I’d found in Backpacker Magazine and we ate them while hiking further up Arch Canyon with minimal gear. By 11am we were back at our campsite at Texas Flats and had stripped off most of our layers: while it was hovering near freezing at dawn, it gradually warmed up as the sun found its way into the canyon, reaching about 18 celsius. We ate our mac and cheese and started breaking camp when all these ATVs came roaring up the trail right to us. We counted at least ten ATVs – a whole family at least – and decided we’d try and stick to the riverbeds and side canyons (where they couldn’t follow) as much as possible. A couple miles back toward the trailhead we deked off to a side canyon on the left in search of springs we’d seen noted in the hiking book. After stashing our backpacks, we hiked for an hour, clambering over boulders and learned an important lesson: grey rocks = solid; red rocks = crumbly sandstone you can break your neck stepping on. Or in Doug’s case, his bum. In the end the mythical springs turned out to be trickles of water dripping off moss on these rocks. Not quite the impressive founts we had imagined. 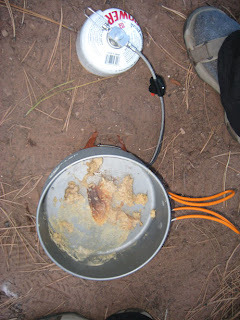 But, the water was cold and wet and after pumping it through a filter, boiling it, and dousing it with chemicals, we figured it was safe to drink and cook with. And we must have been right, because no one got dysentry on the trip (well, Riker had an interesting day after the pancake batter…). That night we hiked to another well-groomed camping spot closer to the trailhead. It was a little trickier to navigate all the cacti, but other than Riker getting one ‘spike ball’ stuck in his paw (and then in mine when I tried to remove it) we managed. At day break on Saturday we packed up and headed back to Ellie – and just in time to avoid a veritable onslaught of ATV-ers there to celebrate the Columbus Day long weekend by laying siege to Ute territory. We made it back to the ‘real’ Green River mostly in one piece, but thoroughly exhausted from exercise, the long drive, and Riker’s ‘watch-dogginess’ that began with the birds’ rustlings at 4:30am. Then on Sunday we rectified the pancake incident by eating the most delicious home-made blueberry-flax pancakes ever (a high-altitude recipe I’ve been tweaking since moving here a year ago). Monday we celebrated the controversial Columbus Day aka Canadian Thanksgiving aka El dia de la Raza the right way: by gorging on margaritas and fajitas at Don Pedro’s restaurant! Ole! Now the camping gear is stowed until the spring, except for Riker’s backpack, which is not only practical but cements our reputation as the yuppiest family in good ol’ Green River. Looks like you're making great use of the last of your time in the States. Where to next? I appreciate your blog so much. I know that I have been negligent about keeping in touch, but I catch up with you through your adventures as Dani Canuck quite often. We really should have that phone date one day soon! 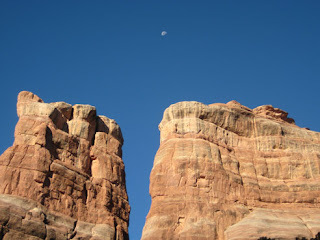 ps – I loved Moab when I visited briefly a few years ago!